Donna and the Bears: Teddies Worldwide Preview Page is open! Visit the preview page at www.teddiesworldwide.com . 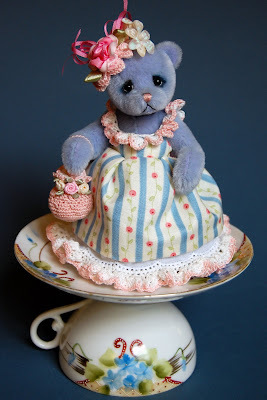 My little preview bear is Blue Bella! You'll be able to vote for two bears - one under 5 inches and one over. Enjoy! like the whole set and each bits of detail, wonderful! already vote on her. Thank you so much, Susana! I was lucky to find the pretty tea cup at a local antique shop. Glad you like the detail!! You bet, Wayne! And thank you so much for writing back!!! I won't try to publish from my phone again!! Bella is so beautiful. I love all the details you have put into her attire and even the teacup that compliments her dress! Thanks, Sis! You are so sweet to say so! I'm glad you like her!